My sister and I spent a wonderful day at Scottsdale Pen and Knife when I visited her in Phoenix earlier this month. It was our second visit to Jay’s amazing store; read about our first visit in 2014 here and here. I will write a full account of this year’s visit, but for today I want to focus on one of my sister’s purchases that day, a breathtaking Cross Botanica in the Green Daylily pattern. She graciously allowed me to photograph it and play with it for this post. The finish on the Botanica pens is inspired by the floral patterns used in henna designs. According to the Cross website, the Daylily pattern has “a radiant green and ivory palette that sparkles with 23KT gold plate inlays and appointments.” My sister said she wanted a “pretty” pen and we both feel she chose the prettiest one in the store. Here’s the box it came in. And inside the box. The Cross warranty and information, as well as cartridges, are included underneath the pen bed. Isn’t it gorgeous? So ornate and very feminine. My sister first spotted this beautiful pen at home in Calgary at Reid’s so it’s been calling to her for a while. Who could resist? A close up of that beautiful finish. It came with a medium nib, which was a change for her, but a happy one. My sister is very particular in her writing instruments (as am I) and really enjoys a snap cap as opposed to a screw cap. She likes her sections as smooth as possible and this model fits that criteria. The cap is what I call a “soft snap”: there is extra padding inside so that the cap gently slides into place when engaged. That padding protects the barrel when posted as well. And here is the nib. 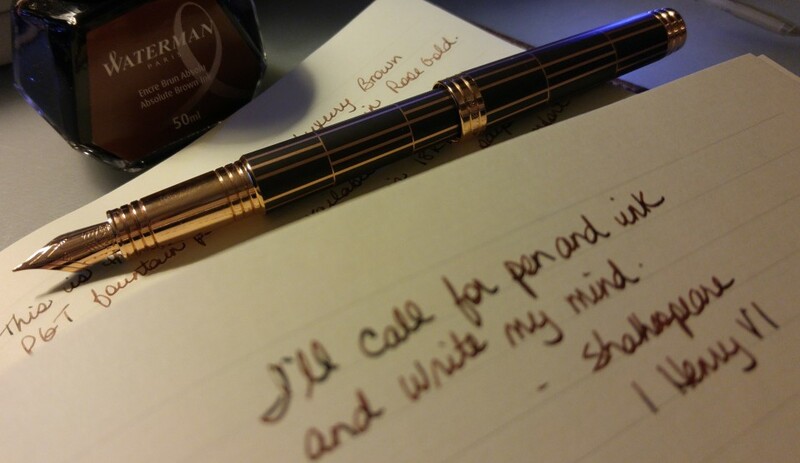 Gold, to match the rest of the pen. Just stunning. The section is black and slightly striated. So comfortable in the hand, although a tad thin for me. At it’s widest point the pen is only 10.9 mm wide. It is 155 mm long. The website doesn’t list the weight but it feels super light. The nib is unbelievably smooth. There’s just nothing like writing with a gold nib. We inked it up with Waterman Inspired Blue and it had great flow, with no skips or hard starts. And here’s the writing sample. I think Inspired Blue was the perfect choice. And here’s a shot of the pen posted. As I said before, the extra padding inside the cap would protect the barrel from posting but perhaps posting is not recommended, as you wouldn’t want anything marring that exceptional finish. My sister is not a poster and I promise I only posted it for the shot; 30 seconds tops, sis! You make my pen look stunning – thank you! It is a joy to look at, certainly, and it is an exceptionally smooth writing experience. I’ve left it in Phoenix, and I look forward to spending time with my new beauty when I next return there. This trip has become a happy annual treat for the both of us! I am very jealous of your sister! Might be the prettiest pen I’ve ever seen.